...and an all new set of costume weapons! Hello! The new bow is on the other side tho. few people in the game really farm... let's see if with that new costumes weapons we find more farmers around. Which ones you made? Congrats for the work. When i use the new katar in costume tab with my true katar in the avatar tab - the name of the boosts dont get blue. I mean... seems like is not activated but im using my true katar on avatar and that new one like costume. I got 2 Katars doing lucky spin. Also a 2 Hand-sword but i not tested. Edited by GokuBlackBR, 09 November 2018 - 08:27 AM. Thanks for the report! I've forwarded it to the ROSE team. If anyone has a different costume weapon with the same issue, please let me know so I can inform the staff. Thanks for the report! I did already send a message to the staff about this issue. Why are we posting here if everything has to be forwarded to the team? Kinda feel like maybe that could be part of the reason the duping and crashing isn't taken as seriously, not to mention balance. any update at all? how hard is it to give the rewards? Thank you for your reports everyone! 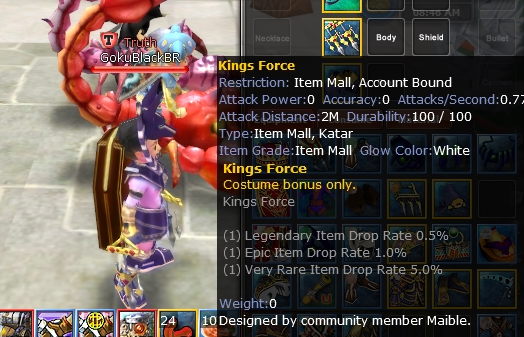 Please know that the ROSE team is aware of the issue regarding the costume weapon appearance, and it appears that the bug is with the appearance and description, but the stats should be working as intended. This should be updated with the next server maintenance. With regards to the reward distribution, please know that I have sent this information to Genesis and will report back as soon as I hear back about the costume weapon rewards being sent out.